Today, I am releasing a report submitted by Jeff Barber and his wife, from El Paso, Texas. The Barbers decided to investigate 47 a mile stretch of “open border” between Mexico and the United States. Barber obviously examined the claims that I made, via a Judicial Watch report, which stated that ISIS had a base camp only 8 miles from El Paso. Mr. Barber provided me with the results of his investigation. Below are key excerpts from the Barber report. My wife and I decided we’d go investigate these matters for ourselves… Several CNN reports included interviews with ranchers, so we decided to go to their ranches as well and see what the real story was for ourselves”. 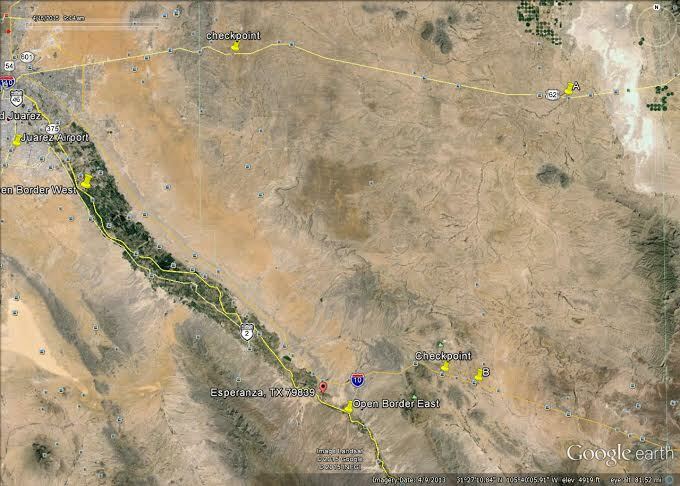 The 47 Mile Stretch of Unguarded Entry Into the U.S.
“There is a 47 mile long “Open Border” with Mexico. This makes It is very convenient for terrorists because what they do is fly to Mexico City, then fly to Ciudad Juarez. 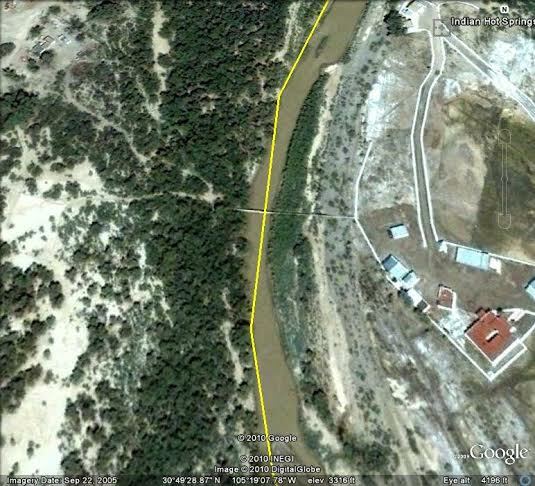 The beginning of the “open border zone” is literally 11 miles from the Juarez airport. 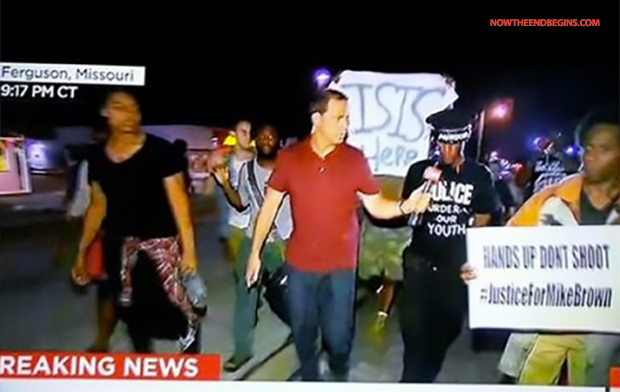 (Editor’s Note: This is the exact same geographic area that Judicial Watch placed the location of the ISIS base camp near El Paso). So think for a second an open border within 11 miles of a major international airport. How convenient is that for the terrorists, called” Other than Mexican’s” to cross into the USA/ Your government tax dollars at work. If you don’t want to get your feet too wet you continue east and come across the border between Esperanza and Fort Hancock where the river is less than 6 inches deep. We put almost 100 miles on our car criss-crossing this 47 mile long open zone and we did not find one…..Not one Border Patrol agent guarding the border. So we drove and drove and we drove some more; we looked and we searched… We put almost 100 miles on our car criss crossing this 47 mile long open zone and we did not find one…..Not one Border Patrol agent guarding the border. So a Border Patrol agent in El Paso told me a 75% reduction in field staffing in East County (the open border zone). The correct answer from our research is that there is 100% stand down of border patrol agents allowing any and everyone to cross over the open unsecured borders into the USA. Regardless of your political affiliation you really have to wonder what is going on here. The people coming into Estados Undios/United States here are not Mexicans. They are categorized as OTM (Other than Mexican). They routinely caught people from (the following countries)…. The last image is an “oldie”. For years the drug cartel had a pedestrian suspension bridge from Mexico to Indian Hot Springs just east of the Open Border zone. Yes your government let the cartel operate their own port of entry to bring drugs and people across for many years. We stumbled across it years ago. (Several years ago an El Paso high school teacher found the bridge; the sheriff’s department later found his head cut off; they never did find his body). Look carefully in the middle of the image and you can see the bridge”. (Editor’s Note: The Judicial Watch report, that revealed an ISIS base camp 8 miles from El Paso, seemingly confirms this report by Jeff Barber. Judicial Watch claims that the Sinoloa Cartel and other cartels now do advanced scouting of high priority targets inside of the United States. Isn’t it interesting that that cartels now behead many of their victims in very similar fasion as to what various Middle East terror groups have done for years. Because of the Barber Report, we now know why ISIS set up one of its base camps near El Paso because this gives them free passage into the country). Please note that the Barber Report represents primary source journalism which is infinitely more reliable than the second hand reports and, often sanitized information, offered by CNN and FOX. Image Border 2: shows you how you (or anyone) can avoid the checkpoints. You come across the river in the Open Border zone either of the following ways. 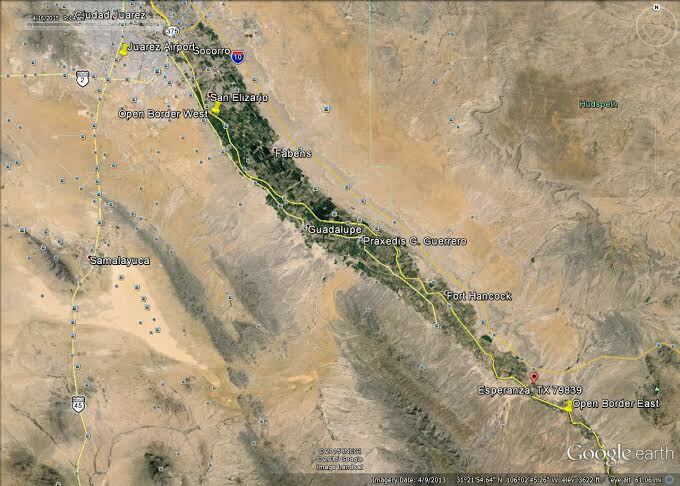 Plan B: You continue along the river from Esperanza to Indian Hot Springs and then head north, from there, You get on Interstate 10 in Sierra Blanca where I have marked “B” literally three miles east of the checkpoint. Obviously once you get to Interstate 10 you can go anywhere in the USA. Yesterday, I received credible reports that both the Tucson and El Paso sectors are employing the use of radiation detectors along I-10 and I-40, respectively and that they are being concealed inside of traffic control vehicles so as to not cause concern among the public. If you did not read yesterday’s the CSS report on the evidence trail that suggests that Chicago could be a target for an ISIS nuclear detonation. The dots are beginning to connect with regard to how many ways American is about to be attacked. It is not a coincidence that there are mass casualty drills taking place and this and other related topics will be the subject of the next article in this series. 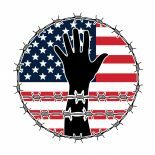 This entry was posted on May 29, 2015 by conspiracyanalyst in Border Security, Society, Terrorism, US News, War & Peace and tagged border security, ISIS, terrorism.